Some people love glitter and other people hate it. Going by this example, I think it’s fair to say that Christian Louboutin really, really loves it. 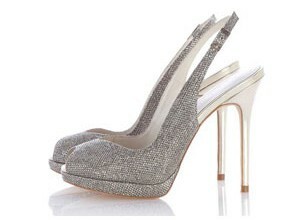 And if you do too, a mirrored platform and a sky-scraper heel might just make you love them even more. Or they might make you feel like you’re wearing the shoe equivalent of a disco on your feet, who knows. 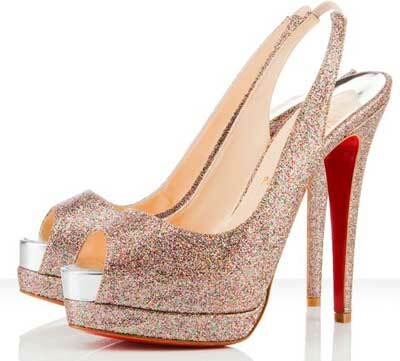 These are the Catenita glitter slingbacks, and they’re $895 from the Christian Louboutin official website. P.S. Want to make my day? Just click on any of the links below! I certainly loved these shoes! There are times when only a disco on your feet will do. I wish I had them on now, they’re probably the only thing that would make me smile today after such a long hard day in the office. I love them! my boyfriend said they’re hideous! I certainly hope he was just trying to annoy me because I LOVE them. Glitter is definitely good in my books. I saw these on a recreational browsing trip through Neiman Marcus, and I thought they were amazing. If I had the financial resources (and a place to wear them), I would buy them. Or, maybe I’d wear them to class with sweatpants and a ratty t-shirt, just because I’m weird like that. Do I even need to say how much I love these? You know it. Just purchased these for my wedding! 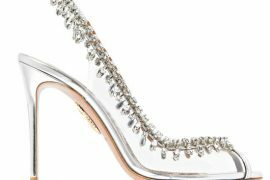 My bridesmaids will be wearing the Hondo3 by Guess which is a similar shoe! So excited! Hidden under my wedding dress is the perfect place for them…will make for some cute shoe shots for the wedding album!